This is my contribution to FuelMyBlog Cookbook. The folks at FuelMyBlog asked for typical recipes from the corner of the world we live in and, given the fact that I don't know how to cook paella (...yet), a delicious tortilla recipe came to mind as a lighting. 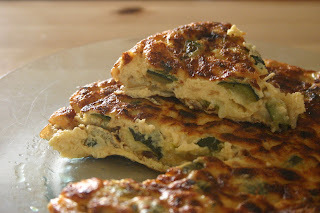 One of the most popular and also easy to cook recipe from Spain is the almighty tortilla. Why almighty? Because you can put into it a lot of ingredients and tastes good, it's a great help for appetizers in a snob ambience or as main course in a casual dinner, and can last up to three days in the fridge. Also, for many spaniards it tastes better the day after cooked. In Spain there's a saying that goes "Not two persons have coffee the same way", but in the case of tortilla and gazpacho, the champion cold soup/drink here, the recipe is basically the same everywhere in the country. I chose zucchini variation because, unlike omnipresent potato tortilla, aka "spanish tortilla", it's only enjoyed at homes and very rare to find in restaurants. Hope you like it! People usually add to this recipe a couple of cloves of garlic finely chopped and even half a small glass of milk. The famous spanish tortilla is made exactly the same way but substituting the zucchini with the same amount of finely chopped potatoes. Other popular variation is with any variety of mushrooms. I fell I love with this dish while in Barcelona recently. It is amazing! !